The team at Lower Calf Creek Falls. Neither dog much liked the waterfall, too much like a giant hose spraying water from the sky. Let’s just get this out of the way: #cancersucks. It’s been over three weeks since I’ve blogged. In that time I’ve been to California via Phoenix twice to visit my sister. R has been holding the homestead together, but we are stronger and more effective together. Nevertheless, stuff must get done. Husbandry and gardening: The turkey poults got their wings clipped when they started flying over the 8′ fence. That stopped their gob. We have started the geese and turkeys on extra grain rations to fatten them up for next month’s date with destiny. If you want to add fat onto an animal, give them grain. Think about that…how many low fat diet fads have followed a low fat/high carb model? The ducks aren’t laying much; maybe 2 out of 6 per day. They will get a light in their pen shortly Deicers have been deployed into two of the four waterers. We are slowly putting the garden to bed for the winter, taking the time to get all the grass runners out of the raised beds as we go. Event if we don’t finish it all, we will be much further ahead next year than ever before. We’ve ripped out the four year old strawberries and are going to try an overbearing variety next year. We are still holding off on bringing in the root vegetables. It’s cooling off, but not cool enough in the garage just yet when they are doing fine in the dirt. We have been sampling though: our first year growing rutabegas and they are much nicer than turnips. Who knew. The celeriac was interesting, but mild. The beets were a bust—next year I will add rock phosphate and bonemeal to my root beds, although the carrots and potatoes did just fine. One thing I have left to try is the salsify. It’s buried between carrot rows somewhere. We brought in the corn and squash. The corn never dried out properly, some sprouted and some started to ferment, not sure what’s up with that or what we’ll do about it. And after three years of trialing a bunch of different squash, I have narrowed down what works to Burgess Buttercup and Burpee Bush Butternut. NO MATTER WHAT, I will not be tempted by any more seed catalogs. Food, harvest and preserving: Tomato sauce, diced tomatoes, and salsa all run through the canner. Since the NCHFP says not to can tomatoes from frosted vines, we have been roasting those and freezing them. There are only about a dozen left on the counter to ripen now. In a good year, I get tomatoes to last until Thanksgiving. I have been experimenting more with lacto-fermenting to preserve foods. We have almost finished off a half gallon of salsa and I am doing a carrot/cauliflower/jalapeno escabeche right now. When we harvest the carrots, I plan to do a load of the little ones that won’t store well. And after everything else is done, I want to try some more sauerkraut. My previous attempts have been way too salty, but I am trying a new book of recipes that cut the salt way back. Finances: I’m still not sure whether going to Costco once every 4-6 weeks is saving us money or not. In between, the weekly grocery trip runs about $30, and the freezer and pantry are still full of nice things to eat. We have a stash of goodies in a separate closet for entertaining, otherwise we’d eat all the cookies the first week. I still want to buy a half pig this fall. Energy and conservation: Waterers outside and one electric radiator inside -we’ve seen the lowest power bill of the year. At least the water consumption has dropped to near our winter rates. Other projects: We installed the hoophouse film again, with the very nice replacement that the vendor sent in exchange for the damaged roll we got last time. Luckily, the exchange meant returning only the damaged samples, not the entire 40×50′ roll. This time, we timed it right and were able to do it ourselves without rounding up any helpers. It wasn’t ideal, but the wind conditions weren’t going to last. In fact, we had terrible wind the next day, when a 25mph gust blew over our new barbecue grill. We figured out a new way to batten down the roll-up sides for winter and the ducks are going to be cozy warm this winter. Community: I have been overwhelmed by the support my friends and community have offered these last few weeks, as I have had very little to contribute on my end. We went to the Heritage Starfest and looked through the fancy telescopes brought by volunteers near and far. I forget now that the Milky Way is something most people don’t see every day. Somewhere in the interval, some friends trailer camped in our yard and I made an impromptu pasta that turned out pretty well, but is the kind of dish that won’t ever be made again because the intersection of garden and refrigerator ingredients was a one-time coincidence of goodness. Creativity and recreation: I bought new boots. The intention is to get out hiking more. 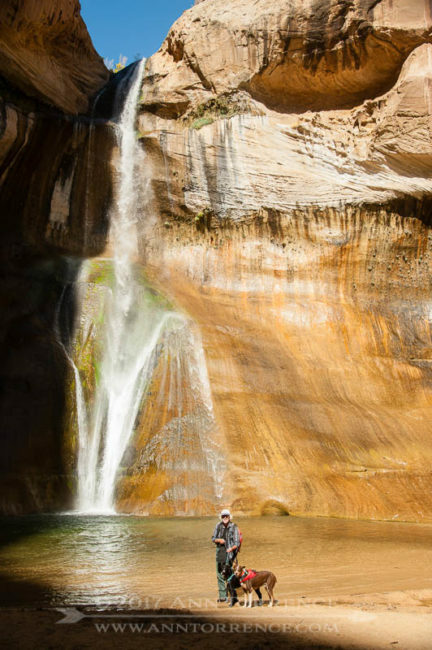 A friend from Australia visited and we took him (and the dogs) to Lower Calf Creek Falls. The dogs did great on their longest ever hike, even though they had to be on a leash the whole way. My footwear-not so great. Money can solve that, and after a couple rounds with Zappos, it did. I have asked for a new daypack for my birthday. My old one is 20+ years old and was about all that fit my narrow shoulders at the time. Now there are heaps of packs designed for women with convenient features that my lose-everything-at-the-bottom-no-matter-how-it’s-loaded pack lacks. Next week: more friends will set up their camper in our yard, then R leaves for his high school reunion. The Entrada Institute has its annual board meeting and we have the last round of irrigation to do before the water gets turned out of the canal. Plant garlic and shallots! Seasonal observations: The aspens were still lovely on Boulder Mountain when we took our Aussie over toward Escalante. It’s been a blue sky autumn, showing off the yellow cottonwoods to perfection. I hear big flocks of sparrows every morning in the currant hedge outside our bathroom. Venus is up in the mornings now, easy to see since sun comes up around 7:30. I’m not looking forward to daylight savings time ending next month, not while we are still racing to use up the good weather in the garden and orchard. Everything in its time: longer nights will mean more time for stargazing and reading by the wood stove. After we get the garlic planted.